I Wood River Valley “Dog Town USA” to I think this is an appropriate blog post. Pets are a joy and a delight that help make our lives feel more meaningful — but let’s face it: The folks who have a problem with pets because of the mess and wear and tear on an average home kind of have a point. Pets shed their fur everywhere. They don’t always smell pristine. If they’re not well-trained, you might have to clean up their refuse, which is never an enjoyable task. Having a pet is absolutely worth the hassle they can cause, but there are also steps you can take to maintain your home so that it’s perfectly habitable for you and your family while you enjoy your fur babies. By taking care of both your pets and your real estate property, everyone will be happier — visitors, inhabitants, and animals alike. Two of the biggest pet complaints by far are the fur-shedding and the smell; “eau de wet dog” is not a favored human cologne for very good reasons. You can help reduce both of those pet peeves by regularly washing and grooming your pet or making appointments for the fur children at a reputable groomer’s facility, which can handle the washing and grooming for you. This is easier to manage for dogs than for cats, although sometimes dogs won’t enjoy the process, either. But if you can be consistent about your pets’ grooming and cleaning, their loose hair will be removed before it can shed on your floors or furnishings, and the oils and dander that pet skin generates as a matter of course will be better under control, helping mitigate any animal odors that could otherwise cling to your home. Another big inconvenience that pets can cause in your home is soiling the floors or furniture if they aren’t properly house-trained. So for pet-owners who want to maintain the value of their homes (or get their full rental deposit back when they move), it’s critical to make sure that all of your pets are appropriately trained to use the bathroom outside for dogs and in the litterbox for cats. There are books and products that can help with this if you’re struggling, but it’s definitely not something to ignore. If you have a pet that regularly goes inside where they aren’t supposed to, make it a top priority to get that pet sorted out as soon as you possibly can; buy a book or hire an expert if that’s what it takes. When you have pets, it’s very possible that your heating, ventilation, and air-conditioning filters may grow dirty before they normally would as a result of filtering pet hair and dander that doesn’t exist in other dwellings. You might or might not need to change those filters more often than you would if you didn’t have pets, but being aware of how your filters are doing by checking them more regularly is important — not only for your own comfort in terms of climate control in your house, but also to ensure that a clogged or dirty filter isn’t causing problems with your systems. Those can be expensive to rectify, and as the saying goes, an ounce of prevention can save you a pound of cure down the road. An additional system you might want to add to your home full of pets is an air purification or filtration system. These can be especially helpful for any household members or guests who suffer from allergies in general and pet-related allergies in particular, as the purifier removes particles (including pet dander) from the air. And they can also help keep your house smelling fresher, even with multiple pets. Dogs need to be walked for exercise, and because we can’t control the weather, sometimes that means tracking mud or dirt inside an otherwise clean house. One way to mitigate messy paws — and save yourself some time cleaning the floors yet again — is to set up a little paw-wash station at the front or back door (or both) to clean off those footsies before any debris from outside gets tracked inside. You’ll need water for washing and towels for drying off at least, but if you want to go all-out, some vendors offer sprayer nozzles specifically for paws, shallow pans for washing and rinsing, and so on. Not all furniture was made for pets to clamber all over, and if you can afford it, upgrading your furniture to a version with pet-friendly upholstery can make life a lot easier for you — and keep your house looking a little bit more tidy. This upholstery is usually stain-resistant, and it’s also typically easier to remove pet hair or fur clumps from it; it’s also easier to clean than traditional fabrics, so all in all, you’ll be saving yourself a lot of time on cleaning and hair-removal. Another option if you don’t want to upgrade your entire furniture set is to purchase a couch or chair cover that fits your piece perfectly — and is machine-washable, making it relatively easy to spruce up your living area when necessary. You can also invest in plastic arm and edge guards for couches and chairs, which help reduce or even eliminate cat-clawings if you just can’t get your felines to use the scratching post instead. Accidents happen, of course, and with pets, it’s even more inevitable that sooner or later, something will spill or an animal will upchuck onto your carpet. To minimize the chance of permanent damage, do your best to clean up any messes that could cause stains quickly, and keep stain remover (preferably pet-specific stain remover) handy for those times when a little cleanup is going to be necessary. If you just can’t seem to keep a pet from making a mess on fabric or carpet, consider using baby gates or another method of (humane) confinement to keep them to areas with tile flooring and washable rugs, and then do your best to clean up after them as quickly as you can. Long nails on dogs can sometimes be hazardous (you definitely don’t want them tearing a nail while they’re running around outside, for example), and the hazard isn’t necessarily confined to the animals themselves. Dog nails can scratch wood flooring and even tear upholstery on furniture, so it’s a good practice to keep them trimmed and neat. This is something you can do yourself at home if you have a pet nail-trimmer, but you can also get your groomer to tackle it for you if you’re taking the dog in to get prettied up on a regular basis. Cats that claw furniture can be especially challenging for owners to manage — many cat owners object to the idea of declawing a cat, and the good news is that there are several alternatives. One newer method of corralling a cat’s natural clawing tendency is to cap their claws, either just the front paws or all four. The little silicon caps are sold in a range of sizes and even colors, so your cat can sport a fancy manicure; after clipping their claws (watch that quick! ), you use the glue included to slide on the cap and let it dry. Some cats are more tolerant of this process than others, so you might need to enlist a thick towel and a helper, but once the caps are on, they stay on for weeks, giving your furniture a break. There are mats made specifically to hold both cat and dog food and water, but a rubber boot tray works just as well if you happen to have one or see one on sale. Using a mat can help catch any food or water spills that might take place while your little fur child is eating or drinking, and they’re usually a lot easier to clean than the floor — just pick it up, spray it down, then put it back down. Maybe your pet’s favorite place to perch is on the couch with you (understandable), but if you can, invest in some pet-friendly beds or blankets that they can use to lounge on, whether or not you’re on the couch. There are lots of materials to choose from, including memory foam and plush mattresses, and the people who make pet beds understand the need to make them as washable as possible; many of them come with removable covers you can wash in your machine. Find some that your pets enjoy, put them in a spot on the floor that gets plenty of direct sunlight, and your work is mostly done! 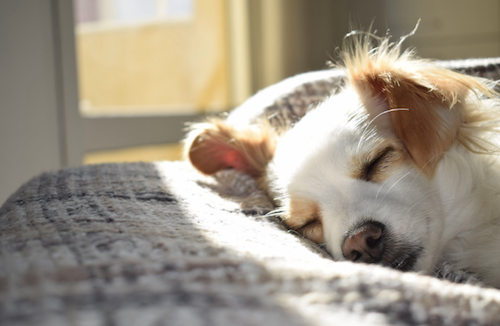 It might not completely eliminate the pet hair on your furniture, but giving your pets their own place to lie down and dream away will definitely help reduce the amount of hair maintenance you have to do on your own favorite lounge spots. If you’ve owned pets for several years, then you already know that not every vacuum is up to the task of managing pet hair on an ongoing basis. Splurging on a vacuum that’s specially designed to pick up plenty of pet hair is well worth the money, especially because you often get attachments with it that can be used on your furniture and in floor crevices to help keep your living areas even more clean. You’ll be amazed by what a difference a specialty pet vacuum makes if you’ve never had one before — and if you already own one, make sure you’re following maintenance guidelines and doing your best to keep it operational for years to come. Almost nothing makes a living area look shabbier than a coat of pet hair on the furniture — and so almost nothing can spruce your area up like some tools to remove that hair easily and quickly. A specialized vacuum cleaner works well, but you might also want to invest in some items like a lint roller and a rubber brush with “fingers” that can comb out and pick up the hair. Your guests will thank you when they no longer have to brush off their clothes after they stand up, and your entire house will look that much sharper when you have a plan and methodology to deal with pet hair. Having both pets and a clean, well-maintained house is not a pipe dream; it just requires a little bit of attention to detail and a few tools to help you do the job. If you’re willing to put the work in, you’ll be able to reap the benefits of both animal companionship and a showcase-worthy living space.